If you don’t follow me on social media, here is the past week of wicked cool stuff I’ve found and shared, minus all the jibba jabba and self promotion, saved here for posterity and the blog-only Luddites among you. 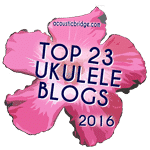 Got the itch to go to a bigger #ukulele festival after watching https://t.co/IamxdlrdVc – Any other *big* mainland US uke fests to consider? Good advice for aspiring pro musicians http://t.co/gSm8e4zt4o – I'm not interested in playing for $, but this applies to almost anything.